We are back and Sheamus and Cesaro walk in the back. Sheamus says they have never seen a weirder looking tag team . . . They see Tyler Breeze and Fandango. Fandango says the Fashion Police have been transferred to a new precinct. They comment on Sheamus’ mohawks and their dresses. They give Sheamus and Cesaro some tickets. Fandango and Cesaro start things off and Fandango takes Cesaro’s jacket. Cesaro with a kick and European uppercut. Cesaro with a shoulder tackle. Cesaro goes for a sunset flip and Fandango stays on his feet and he does some dancing and hits a leg drop for a near fall. Breeze tags in and he punches Cesaro. Breeze avoids Sheamus but he cannot avoid the pop up European uppercut. Cesaro rips off Breeze’s shirt and tags in Sheamus. Sheamus with kicks and then Cesaro gets in a few shots. Breeze blocks a punch and connects with punches of his own but Sheamus runs Breeze into the corner. Cesaro tags in and they hit a double thrust kick for a near fall. We are back and Sheamus and Cesaro are in the ring. Sheamus mentions Braun and he says that he needs to listen up fella. Cesaro says they don’t care who his partner is. Sheamus says it does not matter to them. Cesaro says no matter how big or strong you are, you have to tag in your partner. Sheamus says you have to be on the same page or you will need a Plan B, C, D, E, or F. Sheamus says you will never be a real team. Cesaro says you will never get these. Braun Strowman comes out to the stage. Braun says if you are trying to say that he doesn’t play well with others, then you are right. Braun says management made it clear that he needs a partner to contend for the tag titles and he has one. He was talking to him in the back and he does not appreciate what you clowns are saying. Cesaro tells him to come out if he has a problem. Braun says he will, but he wants a match against one of you. 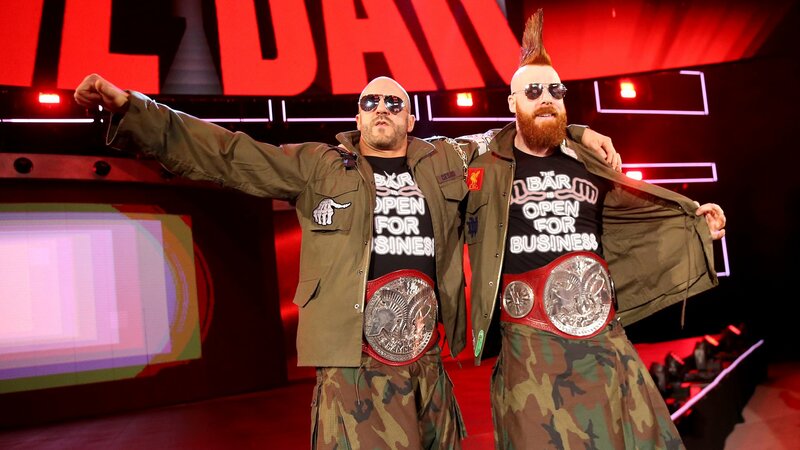 Sheamus and Cesaro think about it and Sheamus says how can they pass up this opportunity. Braun says he will go get him. Braun says he is a lot like him . . . just a little different. Braun’s music plays and it is him in a white shirt and wearing glasses. He says his name is Brains. Sheamus and Cesaro attack Strowman but Strowman fights back. Sheamus with a Brogue Kick and Cesaro punches him. Strowman pushes them off and Braun biels Cesaro and Sheamus goes to the floor. Sheamus says everyone thinks you are so tough pushing over trucks but they have figured him out. You scare people when your music plays. Sheamus says there will be no surprises at Wrestlemania so they want to know his partner at Wrestlemania so they can prepare. Braun asks if the two whiny babies want to know who his partner is. All you have to do is get in this ring and beat him. Sheamus wants to know how is that fair so they want an answer right now. Braun says maybe he will get an answer but he guarantees that you will get these hands. Cesaro distracts Strowman but it does not work too well and Strowman with a biel. Strowman goes over the top rope when Sheamus moves. Sheamus with forearms and then Strowman sends Sheamus over the top rope with a forearm across the chest. Strowman sends Sheamus back into the rin. Strowman with a running shoulder tackle that knocks Sheamus off the apron and into the ringside barrier as we go to commercial. We are back and Cesaro tries to distract Strowman. Strowman misses a boot and Strowman gets caught on the top rope. Sheamus with kicks to the leg followed by a DDT and more kicks to the knee. Sheamus with a bicycle kick to the arm and then he continues to work on the arm with forearms. Sheamus with a top wrist lock. Sheamus with knees to the midsection but Strowman gets back to his feet and he takes Sheamus down. Strowman with clotheslines and Sheamus goes to the floor. Strowman with a running shoulder tackle on the floor. Strowman Irish whips Sheamus into the ringside barrier. Cesaro backs away from Strowman. Strowman misses a shoulder in the corner and hits the ring post. Sheamus goes up top and hits a clothesline for a near fall. Sheamus with a kick to the midsection and more kicks to the back. Strowman with an elbow to Sheamus and a punch to Cesaro to knock him off the apron. Sheamus misses a boot in the corner and Strowman with a splash and power slam for the three count. Braun Strowman makes his way to the ring. Braun says last week he won the Tag Team Battle Royal by himself. Braun says he is going to Wrestlemania. Earlier tonight, he was informed by management that he needs to have a partner. Braun says he does not think he needs a partner. He knows he can win those tag titles by himself. Sheamus and Cesaro interrupt and Sheamus tells Braun to hold on a second. He says Braun is out of his mind if he thinks he can beat them by himself. You won last week by yourself, but throwing people over the top rope is different than beating the greatest team in the WWE. Cesaro you don’t become a tag team overnight. It takes time to build chemistry with your partner. You have to train together, eat together, drive together, sleep together. 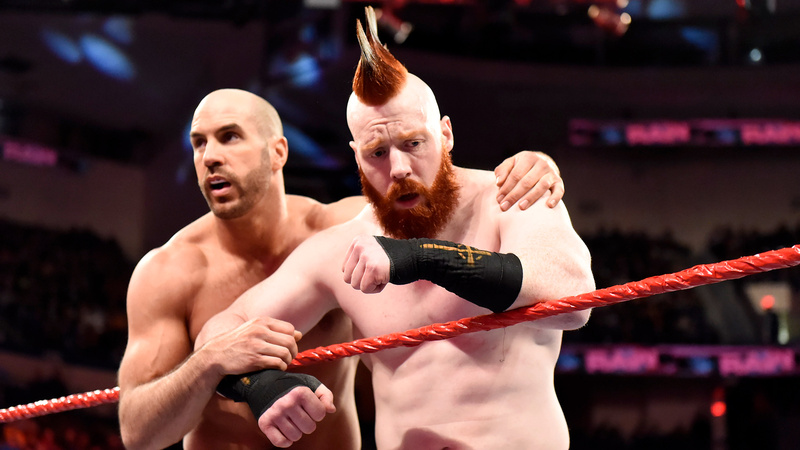 Sheamus clarifies what Cesaro meant by ‘sleep together’. 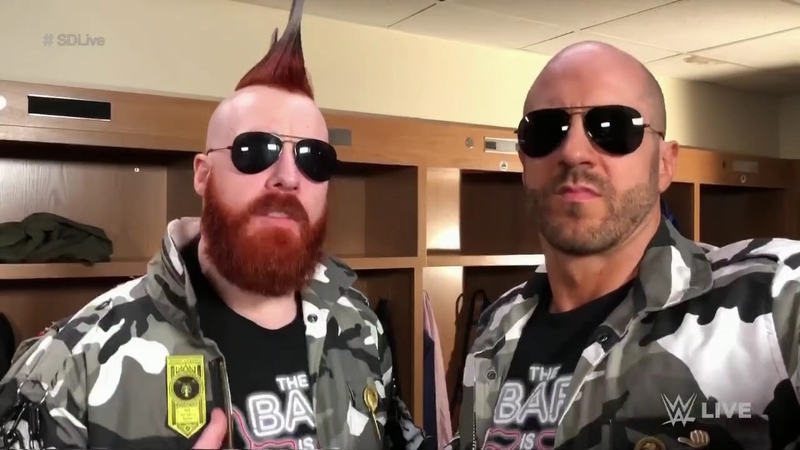 Sheamus says it does not matter who your partner is, you don’t stand a chance because they are going to walk in and walk out as the tag team champions. Braun tells them to shut up. Sheamus asks Braun if he thinks he is tough. They have beaten every team on Raw and Braun and his partner will have the same fate. What Brock did to Roman is nothing compared to what they will do to them. Braun says he has a partner and he gets to have a match against one of them right now. 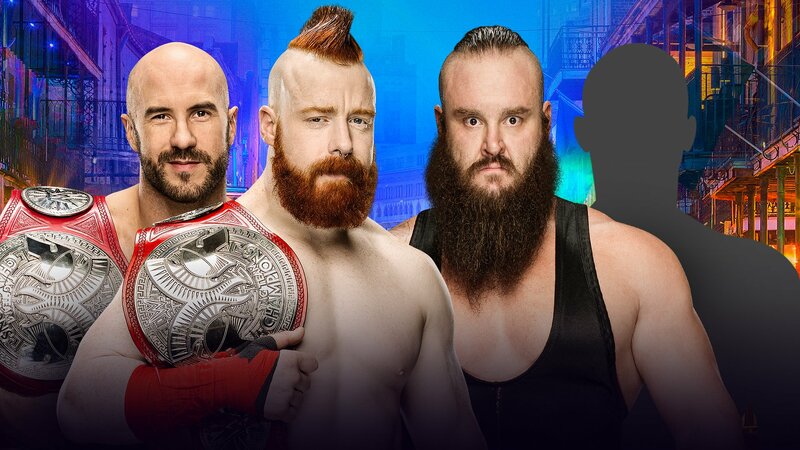 Sheamus and Cesaro both get on the apron and Cesaro is the one to face Braun. Braun sends Cesaro into the turnbuckles and then Irish whips Cesaro into the turnbuckles. Braun with an Irish whip and splash. Braun with another Irish whip and Cesaro goes over the top rope to the floor. We are back and Strowman backs Cesaro into the corner but Cesaro jumps back onto Strowman’s back. Strowman gets Cesaro off of him again. Cesaro with a series of kicks and punches. Strowman blocks a suplex attempt but Cesaro avoids a suplex from Strowman. Strowman goes over the top rope when Cesaro moves and then Cesaro with a baseball slide. Strowman hot shots Cesaro onto the ringside barrier and then Sheamus decides that Cesaro is good without his help. Strowman backs Sheamus up and that allows Cesaro to try to attack Strowman from behind but Strowman catches Cesaro off the steps and sends him into the ringside barrier. Strowman misses a charge into the corner and hits the ring post. Cesaro with a drop kick to the back followed by European uppercuts. Strowman blocks a Gotch Style Neutralizer and Strowman sends Cesaro to the floor. Cesaro with a springboard corkscrew European uppercut. Strowman with a punch and splash into the corner. Cesaro gets out of the power slam when Sheamus distracts Strowman. Strowman goes to the floor and he tries to hit Cesaro with a running shoulder tackle but Cesaro moves and Sheamus goes down. Strowman misses a splash into the corner and Cesaro tries for a rollup but Strowman does not go down. Cesaro goes to the turnbuckles and Strowman catches him when he comes off and Strowman with a power slam for the three count. We are back and Cesaro tells Angle what happened was wrong. Kurt says they made challenges and the teams responded. Sheamus says they have beaten every team and they wanted someone to step up. 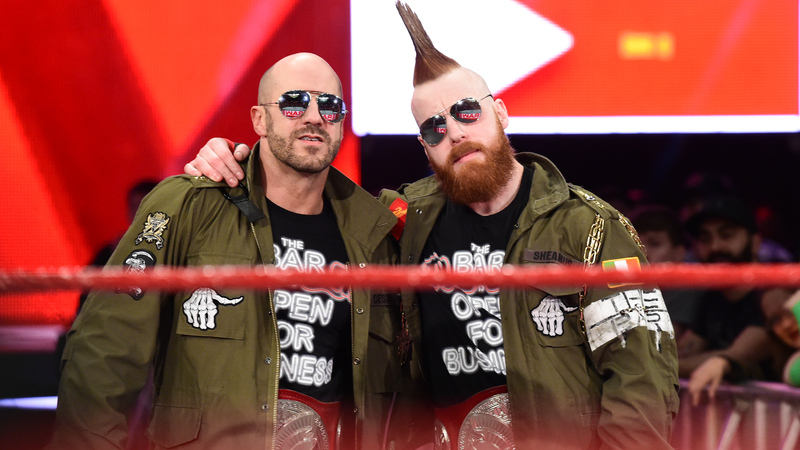 Sheamus and Cesaro say they don’t feel safe on Raw. They want to be traded to Smackdown. They can face the Bludegeon Brothers or the New Day. What about the Usos. Cesaro says they will even take on Breezango. Kurt says he is not trading them. Kurt says there will be a tag team battle royal tonight to determine who Sheamus and Cesaro face at Wrestlemania. Sheamus and Dawson start things off and Sheamus with a side head lock take down. Sheamus with a shoulder tackle and then he poses with Cesaro. Cesaro tags in and they hit a double thrust kick. Sheamus tags back in and he punches Dawson. Dawson is sent to the apron and he stops Sheamus from connecting with the forearms. Dawson with punches and he drops Sheamus on the top rope. Wilder stops Sheamus from hitting White Noise and then Wilder with a sunset flip for a near fall. Cesaro and Dawson tag in and Dawson with a gourdbuster for a near fall. Cesaro goes to the floor and we go to commercial. We are back and Sheamus kicks Dawson and tags in Cesaro for an elbow from the turnbuckles. Sheamus tags in and he kicks Dawson and gets a near fall. Dawson with a jaw breaker and Wilder tags in. Wilder with a drop kick to the back of the knee followed by a drop kick from Dawson. Wilder gets a near fall. Wilder with kicks and then Dawson tags in and kicks Sheamus in the arm. Dawson chokes Sheamus in the ropes. Sheamus and Dawson exchange punches but Dawson with an arm bar. Sheamus with a back body drop and Cesaro tags in. Wilder tries to interfere. Dawson with a DDT for a near fall. Cesaro with an Irish whip and European uppercut. Sheamus tags in and hits a shoulder in teh corner followed by a knee lift. Cesaro tags in and Dawson avoids Sheamus who goes into the ring post. Wilder tags in and they hit a powerplex for a near fall. Dawson tags in and Sheamus with a Brogue Kick to Wilder. Cesaro hits the Gotch Style Neutralizer for the three count. Cesaro distracts Titus and Sheamus with a Brogue Kick for the three count. Apollo helps Titus up and Cesaro faces Apollo. Cesaro with a knee but Apollo with a kick and cross body for a near fall. Apollo with a series of rollups for near falls. Cesaro with a punch and Sheamus tags in. Sheamus with an Irish whip but Apollo floats over and hits a drop kick for a near fall. Titus tags in and he sends Sheamus into the corner but Cesaro is tagged in. Titus with a shoulder tackle. Titus picks up Cesaro and connects with a chop. Apollo tags in and he sends Cesaro into the corner with a shoulder. Titus with a slam and Apollo with a leaping elbow drop for a near fall. Titus tags in and they hit a double shoulder tackle. Titus with a hard Irish whip. Apollo tags in and he punches Cesaro. Apollo presses Cesaro over his head and then he hits a standing shooting star press for a near fall. Apollo kicks Sheamus off the apron and he hits a moonsault from the apron onto Sheamus and Cesaro. We are back and Apollo punches Cesaro and tries to make the tag. Apollo with more punches and then he back drops Cesaro over the top rope to the floor. Sheamus tags in and he goes for a slam but Apollo escapes and he tags in Titus. Titus with a shoulder tackle and clothesline. Titus with punches in the corner followed by a biel. Sheamus with a boot but Titus with a power slam. Titus barks and hits a splash into the corner. Titus with a power bomb for a near fall. Apollo tags in and he hits a frog splash for a near fall. Titus sends Cesaro to the floor and Sheamus sends Titus to the floor. Apollo with a rollup for a near fall. Apollo with an enzuigiri followed by a standing moonsault for a near fall. Cesaro pulls Titus off the apron but Titus with a clothesline. Sheamus hits Titus from behind and sends him into the ringside barrier. Apollo with a pescado. Cesaro tries to stop Apollo on the turnbuckles and Sheamus kicks Apollo to the mat. Cesaro tags in and they hit the Spike White Noise for the three count. After the match, Sheamus and Cesaro are interviewed in the ring. Sheamus says they had their number tonight and it was zero. Cesaro says two men walked into The Bar . . . Sheamus says nobody walks into The Bar and nobody gets up. They run through the teams that have fallen to them. Sheamus asks how does his hair look. Sheamus mentions Jason Jordan and Cesaro asks ‘who’. Sheamus says everyone wants to be part of Wrestlemania. They are going to be punished because they are so dominant. Who is there left if there is no one to beat.